Please note: Massages are not at the yoga class location. Same day appointments are sometimes available but it’s best if you can schedule ahead of time. Call 808-214-0129 for more information. I approach my clients based on their individual needs. After I find out their activities (work, exercise/sport and basic lifestyle) We create a customized treatment from the options listed below. I blend these options to cater to each individual. You may choose treatment options that attract you most, or we can both discuss what treatment would suit your needs best. My intention is to empower clients in their own healing process(es). Please keep in mind the pressure can be adjusted to your needs. You may want deep, medium or light pressure depending on preference or past injuries. Let Johanna know before and during the massage the amount of pressure that will help you heal and relax. I bring everything needed, massage table, music etc. Relax while I travel to your place of stay or home. If you have a small place, no worries, I usually move a coffee table aside or the massage table can be set up on your lanai (patio). Serving South Maui, Central, Upcountry and the Northshore. Johanna’s recommendation is a Meditative massage: A blend of Swedish, Lomi-Lomi, Shiatsu and Thai with attention to repetitively stressed areas of the body. This meditative massage uses customized pressure and is both therapeutic and relaxing, encouraging space in the body and stillness in the mind. A popular modality of bodywork, one of the primary goals of the Swedish massage technique is to relax the entire body. Swedish massage uses long gliding strokes towards the heart to increase circulation and release muscle tension. Therapeutic massage, focuses on specific areas to provide relief from injury or to improve athletic performance. Johanna is very experienced in this effective modality to reduce stress, muscle tension and increase range of motion. Deep tissue may include cross fiber friction, stretching, traction, hot therapies, deep effleurage and point work and petrissage. A Hawaiian massage using long patterned strokes employing the hands and forearms. This is an ancient healing tradition native to the Hawaiian Islands. Different parts of the body are massaged at the same time so the mind can relax. The mind has trouble concentrating on two things at once, so it switches off enabling relaxation. The long fluid movements are helpful for circulation, clearing blockages in different systems of the body. Specifically addresses muscle groups used during exercise, including stretching and point work. Massage is known to help increase circulation and push out excess lactic acid which can develop during strenuous sports or exercise. Sports massage may include cross fiber friction, stretching, traction, hot therapies, deep effleurage, point work and petrissage. Specifically designed to alleviate stress from the upper body. The upper body is a common area to hold stress and muscle tension, especially with forward head posture in computer/technology use. Massage therapy can greatly release adhesions and nerve compression and repair injured tissues in tendons, muscles and ligaments. If you’re not comfortable with a full body massage having your hands and feet worked on is a great way to get therapeutic and relaxation benefits. Reflex points in the hands and feet affect corresponding area throughout the entire body. Acupressure to reflex points sedates or stimulates energy flow and circulation. If you are uncomfortable with trying massage therapy, reflexology is a great place to start. Essential oils of your choice are combined with massage oil to delight the senses and relax both body and mind. I have many essential oils to choose from. Advanced request necessary. Japanese pressure point along meridians of the body to help ward off illness and maintain good health. Treatment performed over loose comfortable clothing. Recommended in combination with Swedish and Lomi-Lomi. Compression, stretches and pressure points are applied along energy “sen” lines. Elongates muscles and reduces stress. I blend Thai body work with Swedish and Lomi massage to maximize therapeutic value and increase relaxation. Addresses the specific discomforts that may be experienced during and after pregnancy. Side Lying position is often used with various pillows for supportive comfort. Pediatric massage helps children reduce anxiety, pain and discomfort. It is an effective modality to improve self awareness, self esteem and confidence. If desired to reduce muscle tension and soreness, Johanna offers the addition of topical analgesics to your therapeutic massage. Currently brands used are Sarada Ayurvedic Remedies, Topricrin and Biofreeze. Your massage therapist will probably use lotions, cremes or oils to decrease friction on your skin. If you have any allergies, tell your massage therapist. Music might be played during your massage session. If you find music distracting, let your massage therapist know your preferences. The same goes for talking during the session. Report any discomfort you experience during the massage session, whether it’s physical or has something to do with environment, such as room temperature, music or lighting. Provide your massage therapist feedback during the session concerning pressure. If the pressure needs to be more or less or if anything doesn’t feel right, communicate it to the massage therapist. Discuss any apprehensions you have about massage therapy with your massage therapist. Remember, your massage therapist is a professional who is dedicated to their profession. I strive to make my massage and yoga practice as environmentally friendly as possible. 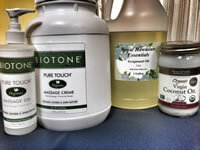 I mainly use an organic creme for the massages but also use natural oils such as grapeseed or coconut. I also use organic cotton sheets. Let me know if your prefer me to use your own massage oils or if you have skin sensitivities and need to specify between the creme and oils, please let me know when you are setting your appointment.